Marcelo Matere has posted the inks and fully colored version of the cover to IDW’s Maximum Dinobots issue 2. If you have not been following the story, this cover might be a spoiler for you! Click on the thumbnail to the left to see the full color version. This is just going to be so sweet. A modern Dinobot Hunt drawn by the volcanic artist Nick Roche, with so many intriguing and original characters, like Hunter/Sunstreaker and Dante/Scorponok. Not to mention the whole Spotlight Dinobots angle, as Furman said that each issue will focus on a different Dinobot. I really can't wait to get the first issue. Dinobots rock!!! I love them!!!! Looks pretty sweet. Has Grimlock had red hands before this? Oh those crazy Dinobots! looking forward to this. That is one awesome cover! Can't wait for this to hit the shelves. I liked the teeth the way Don drew his faceplate. They were way too big and prominent in Spotlight: Grimlock. Also, he appears to have a proper visor again -in his spotlight he had a visor in some panels and then appeared to have unshielded eyes in others. Very nice. Slag looks to be upset that Grimmy gets all the attention. 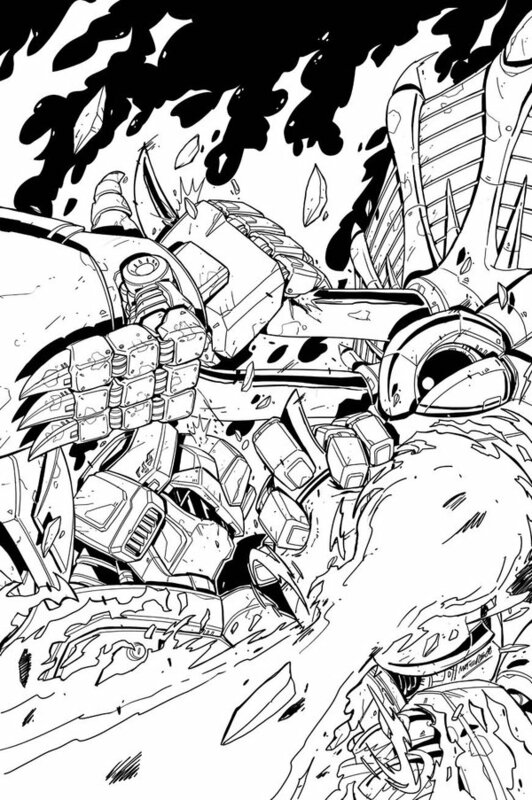 Marcelo Matere has posted the inks and colors to his cover for Maximum Dinobots #2 on his Deviant Art site. 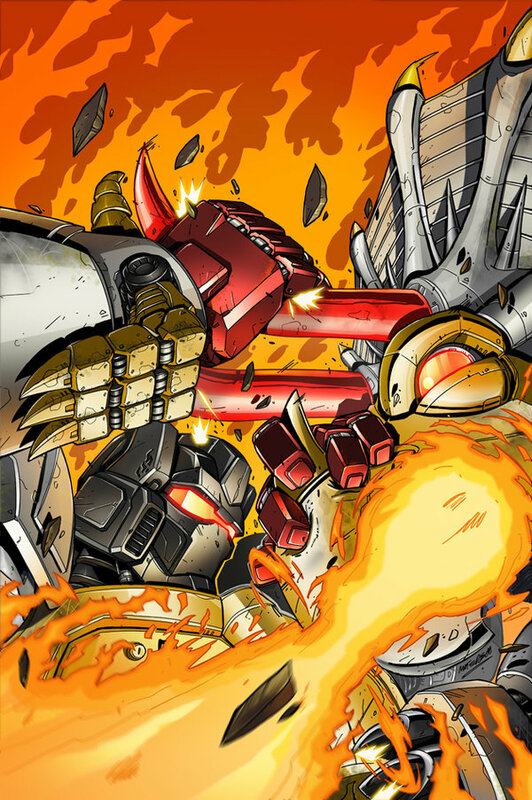 The image features Grimlock entangled with another character and therefore contains potential plot spoilers (but not really, if you've followed news of this series at all).